Being an archivist, I naturally tend to think that the most effective way of understanding the life of a literary or historical figure will usually be through the documentary record. All the same, there’s no denying the fascination which can attach to objects closely associated with the person in question. From time to time such artefacts do find their way into archives: it has been reported that the Humanities Research Center in Austin, Texas, preserves the pair of bed-socks in which the novelist Compton Mackenzie died, and here in the U.L. we keep the composer Sir Arthur Bliss’s Companion of Honour badge along with his papers. In October, a collection of items associated with Siegfried Sassoon will be offered for sale by the Salisbury auctioneers Woolley and Wallis (www.woolleyandwallis.co.uk). Although these objects fall outside the Library’s collecting policy, there are interesting links with documents on display in the ‘Dream Voices’ exhibition. The second display case in the exhibition contains a notebook kept by Sassoon (MS Add. 9852/3/2) titled ‘Details of point-to-point races –1911–12–13–14–’. Sassoon turned to point-to-point racing in 1911, riding his newly-acquired horse Cockbird. The description in the Memoirs of a Fox-Hunting Man of George Sherston carrying off the Colonel’s Cup in the Ringwell Heavy Weight Race is based on Sassoon’s experience competing for the Southdown Heavy Weight Cup in April 1911, and the notebook is opened to show the account of this race. Compared with the fictionalised version, it gives a sparse factual record, noting that the event took place at Cooksbridge, was open to subscribers of fifteen guineas to the Southdown Foxhounds, and attracted ten entries. ‘Won easily’ was Sassoon’s laconic statement of the result. The Salisbury sale will include the Southdown Heavy Weight Cup itself, inscribed with the names of the winning horse and rider. 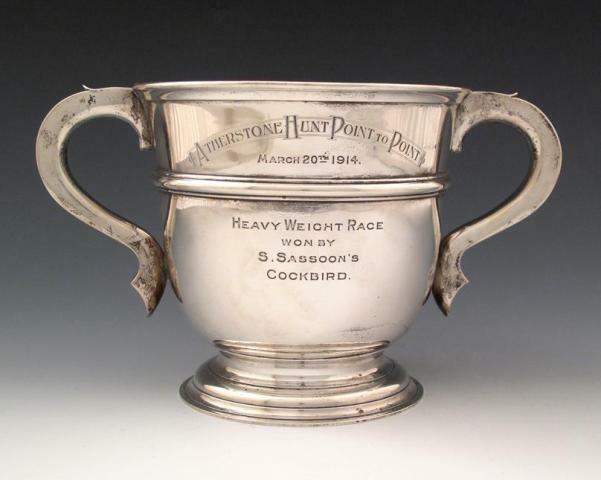 Southdown Heavy Weight Cup, 1911. Image: Woolley and Wallis. The inscription confirms what has to be surmised from the notebook, that the ‘b.g.’ given after Cockbird’s name stands for ‘bay gelding’. The 1911 Southdown was Sassoon’s first victory, in his third point-to-point, and he was sufficiently proud of the performance to have photographs taken of himself posing with Cockbird and the Cup, examples of which are reproduced in the biographies. 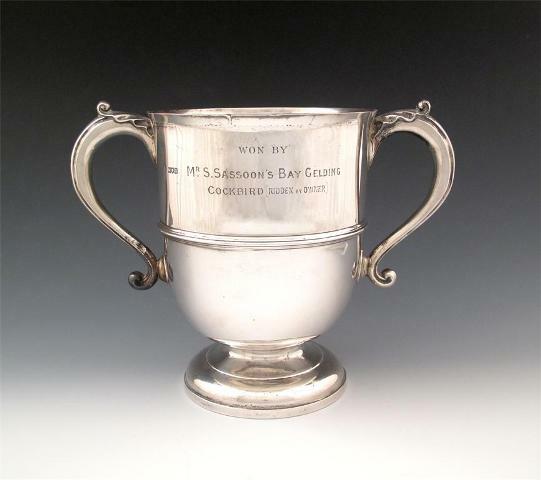 Sassoon and Cockbird went on to win several more races, including the Atherstone Hunt Point to Point in March 1914, the trophy for which is also in the sale. Atherstone Hunt Point to Point Cup, 1914. Image: Woolley and Wallis. Perhaps the documents in the exhibition with the greatest associative power are the diaries and journals kept by Sassoon on active service: the small pocket notebooks he carried with him in France and Palestine. 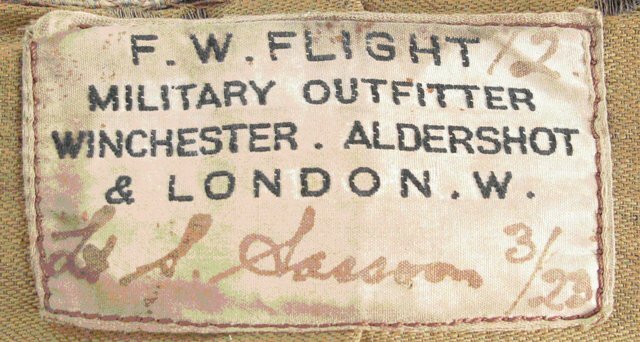 The Salisbury sale will include Sassoon’s Royal Welch Fusiliers service dress jacket, with Military Cross ribbon and Sassoon’s name inscribed on an inside label. 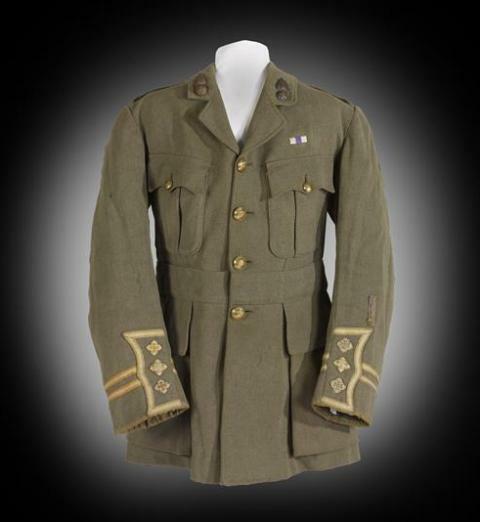 Sassoon's service dress jacket. Image: Woolley and Wallis. Label inside Sassoon's service dress jacket. Image: Woolley and Wallis. The sleeves show Sassoon’s rank as captain, and therefore in its current state the jacket cannot be earlier than 1918, but although there is no proof one way or another, it is easy to imagine one or more of the notebooks on display in the exhibition having at one time nestled in one of its breast pockets. The sale, which will also include hunting costumes, and a candelabrum mentioned in one of Sassoon’s post-war poems, takes place on Wednesday 27 October. A recording of the Sassoon panel discussion in Cambridge on 20 July, with Jon Stallworthy, Max Egremont, Santanu Das and Tim Kendall, has now been made available via the University’s Streaming Media Service: <http://sms.cam.ac.uk/media/866563>. 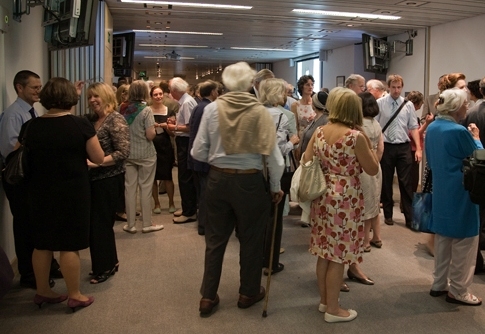 The Library’s exhibition, ‘Dream Voices: Siegfried Sassoon, Memory and War’, opened to the public at 9.00 this morning. The supporting web pages are now visible at http://www.lib.cam.ac.uk/exhibitions/Sassoon/index.html. Our celebration opening event yesterday afternoon went off well. About a hundred people attended a panel discussion in Robinson College, chaired by Jon Stallworthy. Max Egremont spoke on Sassoon’s life and continuing significance as a writer, Santanu Das explored Sassoon’s responses in verse and prose to the death of his friend David Thomas in 1916, and Tim Kendall spoke about ‘The Kiss’, the poem inspired by Major Campbell’s belligerent lecture on ‘The Spirit of the Bayonet’ (Sassoon’s notes taken at the lecture are on display in the exhibition). We’re planning to put a link to a recording of this event on the blog shortly. Then it was back to the Exhibition Centre for the opening reception itself. Alison Richard, the University’s Vice-Chancellor, spoke about the importance Cambridge attached to securing the Sassoon Archive, and of the strong sense we had formed during last year’s fundraising campaign that there was a widespread appreciation in the country of the importance of Sassoon both as a writer and as a representative of the First World War generation. 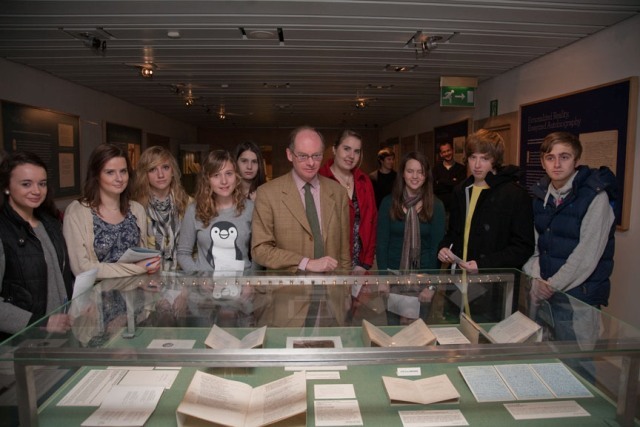 Max Egremont thanked the contributors to the fundraising effort, and underlined the general feeling that the Archive had found its proper home in the University Library, before declaring ‘Dream Voices’ officially open. We hope that as many people as possible will come and visit over the next five months. The cleaning fluid used to give the glass of the Exhibition Centre display cases a last polish has a very distinctive smell – maybe it’s a detergent marketing team’s idea of ‘Pine’. Whatever it’s supposed to remind me of, I always find it evocative: it tells me the job of mounting the exhibition is more or less complete. The fortnights during which we change our displays bring together the work of many of the colleagues who contribute to the exhibitions programme. The conservators, who have appraised every item to make sure it can be safely exhibited and spent weeks making cradles and backing-boards, now oversee the placement of the manuscripts, books and pictures in the cases. Once everything is in position we make final decisions on the shape of the caption labels, and the conservators print them onto heavy paper, cut them to size and back them onto board for a professional finish. While this is going on, Imaging Services mount the wall panels. The panels – a metre by a metre and a half – describe the themes of the display and provide additional visual interest in the form of images of poems, drawings or diary entries that aren’t on show in the display cases themselves. The panels are printed here in the Library, but designed by an external design consultancy which has also worked on various other aspects of the ‘Dream Voices’ project, such as posters, banners and guides. There are four panels surrounding the pillar in the Exhibition Centre, and the Library’s joiners have fixed up a new system of frames for mounting these, which look very smart. Our I.T. experts have prepared a full set of web pages to complement the exhibition, and these will go live at http://www.lib.cam.ac.uk/exhibitions/Sassoon/index.html later today. Meanwhile, my colleague as Joint Exhibitions Officer has been busy working on the distribution of print publicity and the production of large-type texts of the exhibition. At the end of last week, just on schedule, we made the final adjustments to the position of the exhibits and captions: tiny nudgings and touchings, eighths and sixteenths of inches, until everything looks as straight and perpendicular as the uneven edges of elderly volumes and documents will allow. It’s only when exhibits and captions are brought together in the cases that we can see where shadows will fall, and we improvise with stands and mounts to avoid having shady patches in the wrong places. Yesterday morning the electrician refocused the spotlights on the wall panels, and the conservators have taken measurements of the light levels in the cases to ensure against damage to the paper, inks and pigments of the documents. The case lids have been closed for the last time, putting an air-tight seal between the exhibits and the outside environment. It’s now safe to squirt the cleaning fluid. The smell of success? Our visitors will be the judges of that. The journal to which the article refers (classmark MS Add. 9852/1/7) covers a period in mid 1916 when Sassoon was recovering from enteritis or ‘trench fever ‘. It is among the items that will be on show as part of the ‘Dream Voices’ exhibition which opens this Wednesday, and will be displayed showing his observations of events on 1 July 1916, the first day of the Battle of the Somme. Today we begin putting ‘Dream Voices: Siegfried Sassoon, Memory and War’ into the Exhibition Centre. The first job is to unload the exhibits from the previous display, ‘Under Covers: Documenting Spies’. Unloading an exhibition hardly seems to take any time at all: a quick transfer of books, maps and manuscripts onto trolleys, and they’re ready for return to their accustomed places on the Library shelves. Half a year to prepare, and half an hour to dismantle. Still — the decks are now cleared for Sassoon. We’re coming to the end of writing the exhibit captions for the ‘Dream Voices’ exhibition. We try not to let the captions go too far over a hundred words each: if we exceeded that limit too often, a display with fifty or sixty exhibits (most of which are themselves written texts) would present an exhausting amount of reading. I don’t always find it possible to be as concise as I would like. Each caption represents a mini-research exercise, and following the leads through printed reference works and web-based resources often turns up a great deal of interesting detail that will never make its way into the final text. A caption is there to identify the exhibit, place it in context, and perhaps indicate one or two points of interest that might otherwise be missed: perhaps explaining a technical term or identifying a named individual. A recent caption drew me into some unfamiliar by-ways. One of the items received with the newly-accessioned Sassoon Archive (MS Add. 9852) is a notebook used by Sassoon to record cricket matches in which he took part between 1899 and 1905. Most of the matches recorded were played in Kent during his school holidays, when Sassoon turned out for local village sides or for scratch elevens assembled by his brother Michael or himself. Several of the matches were played for an ‘I. B. Hart-Davies XI’, and as the most attractive opening of the book to display in the exhibition had details of one of these matches, I wanted to find out more about the captain of this side. After giving up school-teaching Hart-Davies became an insurance broker in the Midlands. In 1913 he qualified as a pilot, and it was rumoured that he took up flying to try to set another John o’ Groats to Land’s End speed record, by air. However, it was flying that led to his death: he was killed in July 1917 on a training flight as a pilot in the Royal Flying Corps. An obituary notice in The Times recorded that, with three other motorcyclists, he won the Mürren Cup, despite the fact that none of the team had ever done any bobsleighing before. A fellow-officer quoted by The Times called Hart-Davis a ‘gallant fellow whom we all liked immensely’. The King’s School in Canterbury, which has undertaken research on its Old Boys killed in the War, knew about Hart-Davies’s motorcycling exploits, but hadn’t heard of his cricket XI or his links with Sassoon. Among the huge research potential of the Cambridge Sassoon Archive, a cricket scorebook may represent only a tiny part; but nevertheless this document gives us a previously-unseen glimpse of the unusually active sporting life of one of the generation heading unknowingly to war. Welcome to the Sassoon Project blog. 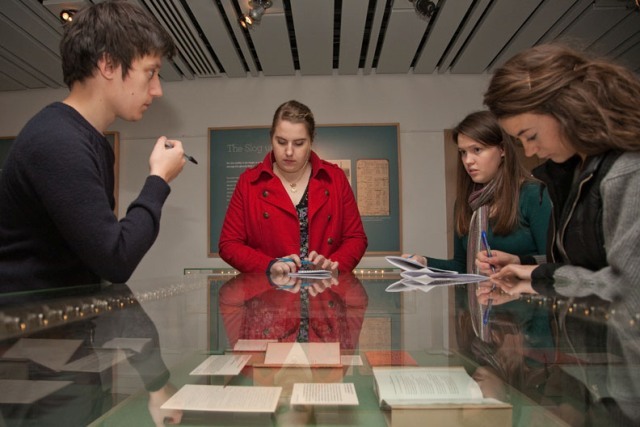 Over the next few months we’ll be using this site to give updates on the progress of cataloguing the Library’s collections of Siegfried Sassoon’s papers, and news of other events such as exhibitions and talks. 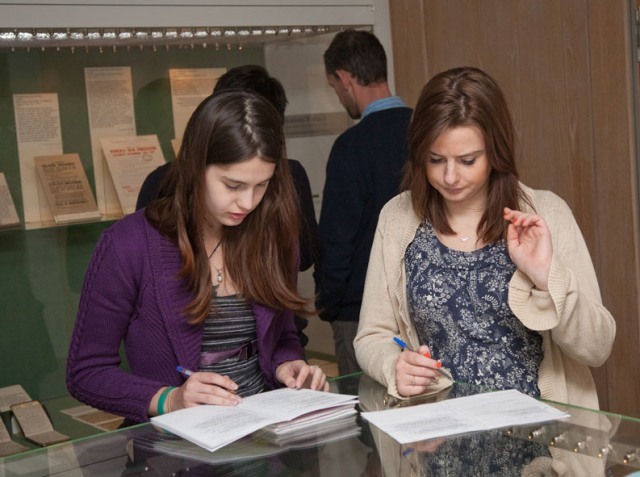 A first date for your diary is Wednesday 21 July 2010, when the Library’s exhibition, ‘Dream Voices: Siegfried Sassoon, Memory and War’ will open to the public. See <http://www.lib.cam.ac.uk/exhibitions/Sassoon/index.html> for details.